Precious metals took an aggressive southerly step backward on Monday as oil prices sank and the U.S. dollar gained against other currencies. New York silver, gold and platinum futures plunged 4.0 percent, 5.0 percent and 3.1 percent, respectively. February crude-oil fell for the fifth consecutive day. Oil tumbled $3.24, or 7.9 percent, to close to $37.59 a barrel — its lowest level since December 24. The average price for regular unleaded gasoline declined two-tenths of a cent to $1.79 a gallon, according to AAA. March silver dropped 57 cents to close at $10.75 an ounce. April platinum fell $31.60 to end at $973.90 an ounce. Gold for February declined $34 to settle at $821 an ounce. "Gold prices fell by nearly $40 or 4.6% in Monday’s New York session. 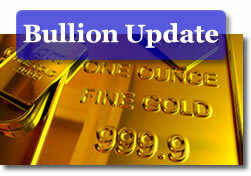 It was the yellow metal’s largest decline in six weeks," said senior analyst Jon Nadler at Kitco Bullion Dealers. "Bullion prices touched a low of $814.60 per ounce on the back of a falling euro/rising dollar/falling oil combination brought on by global background economic conditions," added Nadler. In bullion coin news, the United States Mint on Monday released new gold coin prices that were based on London Fix weekly averages and according to their new pricing policy. Ironically, while gold tumbled, the replacement prices were substantially higher. Check out CoinNews market resources at Live Bullion Spots, the Silver Coin Calculator, U.S. Mint Collector Bullion Coin Prices, and the Inflation Calculator.